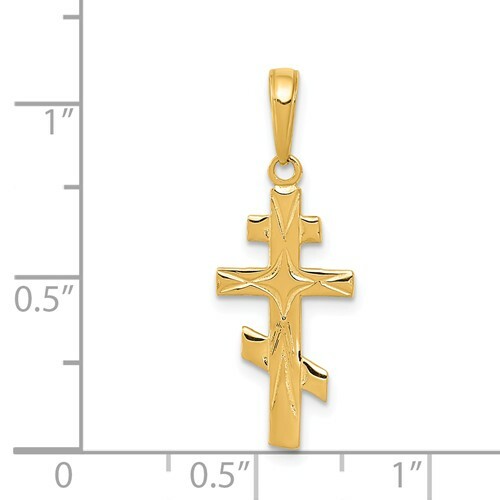 Eastern Orthodox cross pendant is made of polished 14kt yellow gold. Item measures 3/8 inch wide by 3/4 inch tall without loop and bail. Textured back. Made in the USA. Weight: 0.62 grams. Of the three horizontal bars, the top bar represents the inscription posted by Pilate, Jesus of Nazareth, King of the Jews, and the slanted lower bar represents the footrest of Christ. 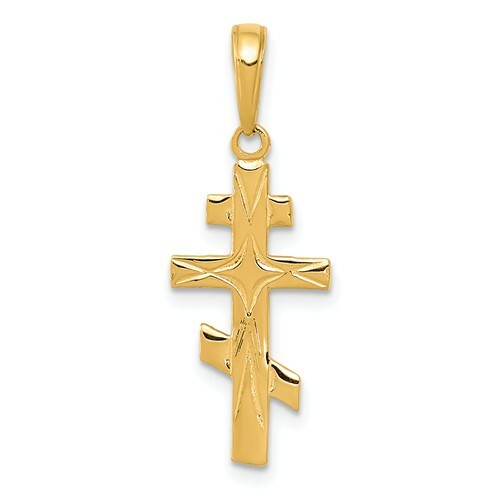 The Eastern Orthodox cross is also known as the Greek Orthodox, Russian Orthodox, Byzantine and St. Olga cross.